Every parent deals with bad behavior from time to time – it’s not just us, right? We get asked about child behavioral problems more than most other parenting questions. How can we deal with our kids’ bad behavior, yet still think about them as we believe they were created to be? When bad behavior happens, it does something in us as parents. We can become instantly exasperated, frustrated and angry. These negative emotions can cause us to overreact to the situation and lash out at our child in a way that is not helpful, and sometimes even damaging to both our children’s self image and also our relationship with them. There are some practical ways you can discipline your child and at the same time avoid some of those negative consequences. Read our post called How To Discipline Your Child Without Damaging Your Relationship for some great ideas and resources that will help your family. When dealing with kids’ bad behavior, the first step is to look inside us as parents. We need to ask ourselves two key questions as we prepare to discipline or correct our child. #1: What is your motivation for addressing their behavior? Is simple behavior modification your goal, or are you trying to help your child become the best they can be? Do you expect instant obedience so life is easier/calmer/looks-better-on-Instagram, or because you want to set them up for success later in life? Do you want them to make good choices because that’s easiest for you, or because it’s best for them? Every time we discipline, we have the opportunity to prepare them for their best life. Our goal for disciplining our kids is to bring out the best in them – not focus on their worst. Ask yourself why you are disciplining your child and make sure your motivation is what’s best for them. #2: How do you view your child? Do you see kids as inherently selfish, dishonest or sneaky? It’s sometimes easier to see what’s wrong with our children instead of what is right and good. It’s hard to be a kid! Kids deal with all kids of mixed messages in life. For instance, it’s OK to throw a ball, but not a rock. Think of how confusing that could be for a toddler! Most times, especially in the younger years, kids aren’t out to get you as a parent. They’re trying to figure out this big world, and it’s our job as parents to help them navigate all the choices they have. Take time to see things from their perspective, and to see them with loving eyes. As parents, we can view our kids’ bad behavior through several lenses. Some parents beat themselves up over the decisions their kids make. Parents consider themselves as failures and see their children’s choices as evidence that we’re not making it as parents. Others focus on their kids’ behavior as evidence that the kids have issues. The kids are broken and not as good as other kids that we see. You can often find incredible strengths that God has given your child imbedded in the very things that drive you crazy. Let’s look at a few examples. A super talkative child can seem disrespectful and annoying. But, if their ability to use words was focused and developed toward a worthwhile cause, amazing things could happen! Perhaps they are meant to be a pastor, or an incredible teacher or salesperson. They can use their voice to move people to take action and change the world. It’s all a matter of perspective. A strong-willed or stubborn child can be difficult to parent. However, what if that stubbornness – developed correctly – could become resolve. Grit. Determination. Perhaps your child can use that gift to run a successful business or conquer a difficult challenge in life. Some of us have children who lie. Although we all can agree that lying is wrong, kids who lie also have amazing memories, strong creativity and often a desire to keep the peace. These tendencies are in our kids for a reason. Even though these qualities are showing up through bad behavior, God knit them into our kids for a positive purpose. Dealing with bad behavior often shows us our kids’ greatest strengths. Look for them! How do we practically bring out these strengths in our kids in the middle of their misbehavior? Recognize the incredible opportunity we have to call out these gifts as we discipline. We need to correct bad behavior! But, we can also acknowledge kids’ strengths that are being used in a misguided way. We acknowledge the strength, and direct it towards something positive while at the same time calling out the ways that strength is being used inappropriately in the moment. We will begin to look at our kids in the positive light of their strengths. Although we need to deal with situations when our kids disobey, we can still choose to focus on who they were created to be. Our kids will know their bad choices do not define who they are. They are created with incredible gifts. If directed to worthy goals, their strengths will allow them to become who they were meant to be. 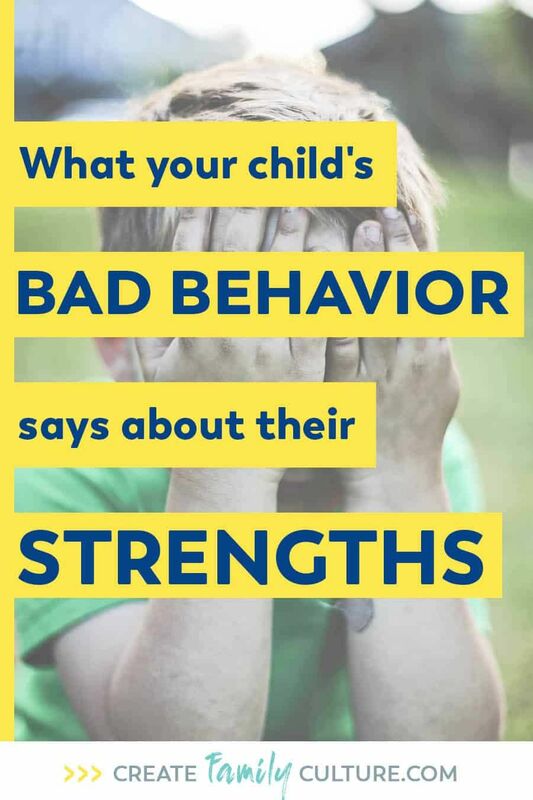 As parents, let’s look for our kids’ strengths in the middle of their bad behavior. What strengths do you see in your kids?